For a refreshing drink on a bright and sunny day, try a Dark and Stormy. This traditionally tropical drink will add some chill to any hot occasion. 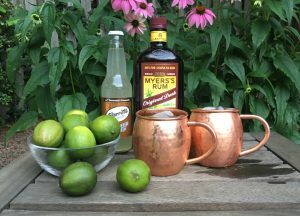 A delightful excuse to use my favorite copper mugs but also tasty served in a rocks glass. Fill your glass with ice, pour in Rum, top with Ginger Beer and add a big squeeze of Fresh Lime. Stir, sip and enjoy!